This operations quick-look will probably be overtaken by events within 24 hours. What is important to establish now is the apparent character of the operation. In my post on the last Israeli strike, on 8 May, I concluded that if Iran didn’t pull in her horns in Syria, Israel would keep the preemptive interdiction going. That looks like what’s happening. A couple of political-level notes to bound our expectations. One, Netanyahu returned from a very brief trip to Moscow just before the operation was launched. We can read this to mean that he conferred with the Russians and has a (presumably limited) charter from them for this operation. Interestingly, in that regard, there was little indication at the outset that the IDF was taking the precautions we would expect if Israel weren’t sure what Russia’s posture would be. In a more operationally uncertain environment, I would have expected Israel to concentrate initially on blitzing the Syrian air defense system to completely neutralize it. That wasn’t happening in the first couple of hours. Israel appeared willing, at that point, to deal with Syrian responses as they occurred. It was after the Syrian air defense system started trying to engage Israeli platforms that we began to see reports of Israel attacking Syrian air defense sites. In other words, Israel waited to gauge what Assad was going to do, and then attacked the regime air defense systems. That suggests the IDF doesn’t expect to have to contend with Russian weapons. That particular expectation simplifies the combat environment, and gave Israel the latitude to respond rather than acting preemptively against the Syrian air defenses. The other note is that Russia is likely to keep whatever commitments the Putin government made. The reason is simple: Putin knows Israel has Trump’s support for this operation. Trump has just demonstrated that he can’t be controlled by nonsense from Iran – and has also shown that if he has to intervene in Syria, he won’t limit his options to dropping leaflets, or sitting around campfires with insurgents and random dudes from Turkey, trying to get liars to stop lying to each other. We can assume Israel doesn’t have an entirely free hand in Syria. But in every operation he has run since he entered office in 2009, Netanyahu has shown he can be relied on to not overreach. As long as he doesn’t – presumably by concentrating on Iranian targets – Russia, Turkey, and the neighboring Arabs will probably watch, grumble a little for the cameras, and stay out of it. The scope of Israel’s target set has been growing by the hour, as this operation has expanded over about the last six hours. I’ll have to make a cut-off here just to get something posted. 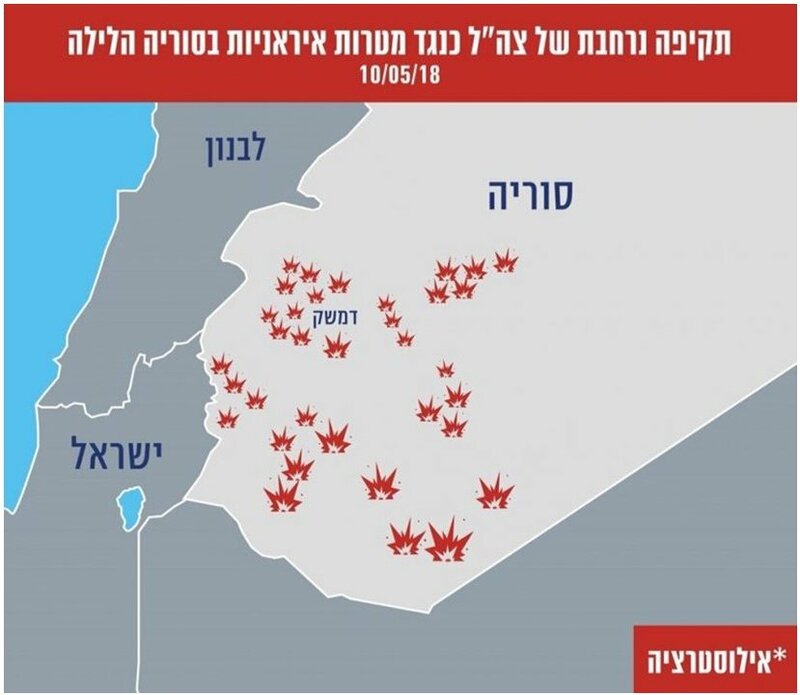 Here is a map depiction of the target locations (including some unit names, if reported) where observers in Syria have recorded Israeli strikes. As of this writing (a little after 0800 on 10 May in Israel and Syria), the strikes have been reported as far north as Qusayr, on Lebanon’s northeast border in western Syria. 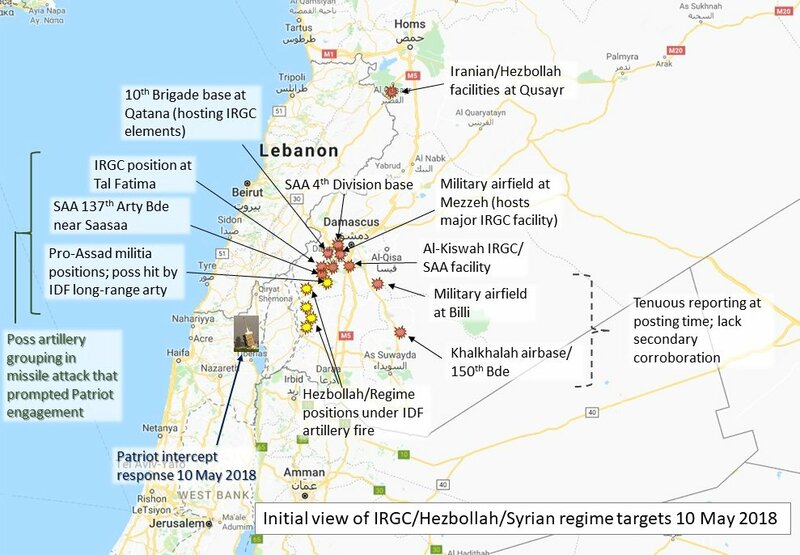 Unannotated view of IAF target locations (Iranian targets in Syria) on 10 May 2018. The sequence of events appears to be that Israel completed the Tuesday night strike on Al-Kiswah, where a growing Iranian presence has been reported for more than a year, and quickly moved IDF forces into northern Israel. Reporting on those movements was limited, but the IDF was on alert, and bomb shelters had been opened for the civilians in the Golan on Tuesday. 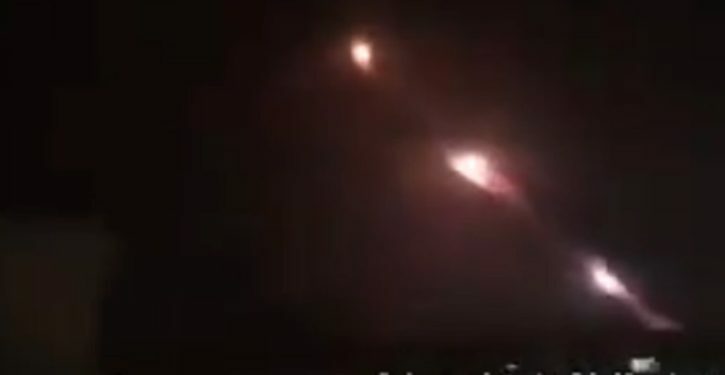 On Wednesday night (technically Thursday just after midnight), Iran’s Qods Force operatives in southern Syria launched 20 rockets at Israel, an unspecified number of which were intercepted by Iron Dome. Shortly afterward, Israel began mounting a multidimensional response, pounding Hezbollah positions in Quneitra, across the Golan neutral zone, with artillery fire, and attacking sites further inside Syria with missiles. Israeli aircraft are reported by observers in Syria to have been over some of the targets in Syria. Since reporting is sketchy, it isn’t possible to resolve at this point which targets may have received personal visits from the IAF for guided bomb delivery. For the targets in the Qusayr area (where both Hezbollah and Iran have a heavy presence, and a suspect facility developed by Iran is thought to be linked to a special weapons program), it appears that IAF strikers made their approach through Lebanon. The Lebanese army reported Israeli planes in Lebanese airspace shortly before the local reports on social media of explosions in Qusayr. Meanwhile, there were social media reports that a Patriot battery near Safed launched missiles in the 0200 hour (Israeli time) on 10 May. 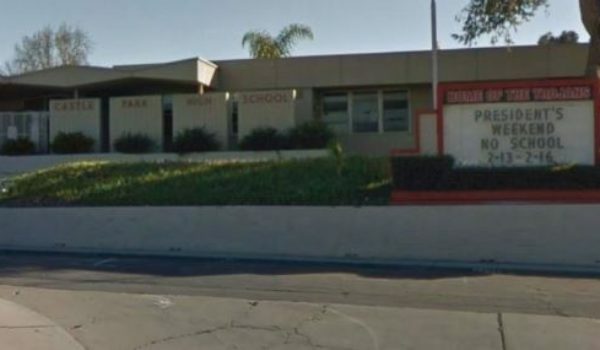 I haven’t seen yet what prompted that action, but given what Patriot is optimized for, it would not have been a short-range rocket or a Syrian surface-to-air missile falling to earth after failing to engage an air target. The launch of one or more Patriot interceptors suggests a Scud-type ballistic missile threat, at a minimum. Hezbollah has been known for some years to have Scud missiles provided by Syria. The Iranian-made, Scud-derived Fateh-110 is also in Syria. 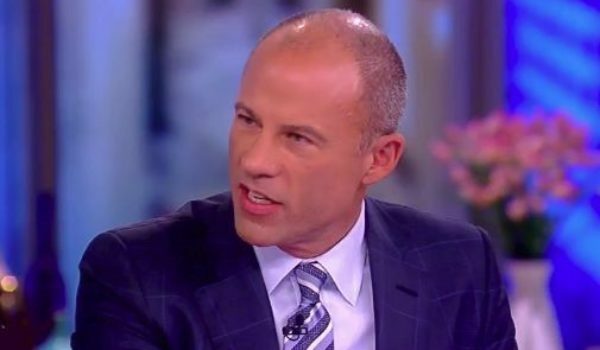 In either case, the systems now have significantly improved accuracy over the wild, wandering Scuds people may remember from the first Iraq war in 1991. 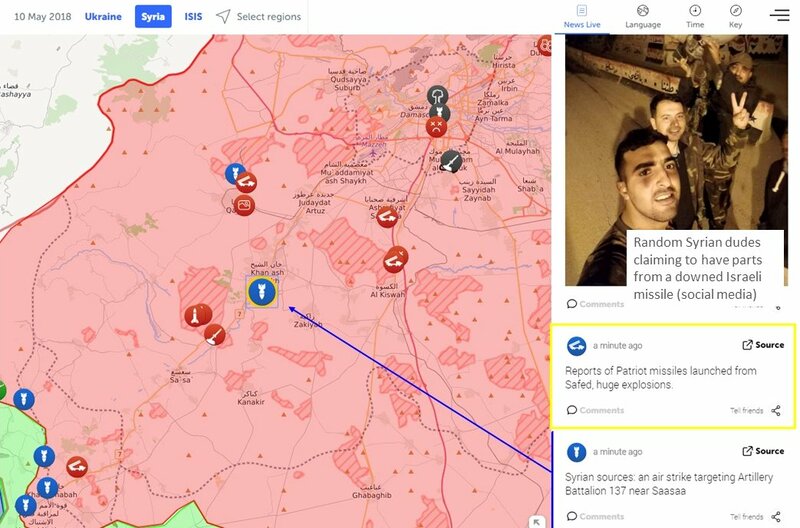 Notably, the Patriot launch report came across Twitter just about the same time as a separate report that the Syrian 17th Division’s 137th Artillery Brigade was attacked in an air strike, which would indicate an Israeli attack. The 137th, launching from near Saasaa (Sasa), southwest of Damascus, may have been the source of a ballistic missile attempt against Israel. Moments later, it was reported that an IRGC position close to Saasaa, at Tal Fatima, was also targeted. IRGC troops may have been operating the launchers or at least directing the fires. An artillery position of pro-Assad militias, co-located with a regime air defense battalion and very close to the 137th and IRGC positions, came under fire as well, although it isn’t clear that the attack was by air strike. 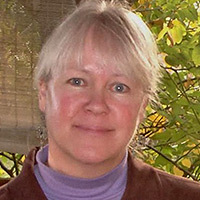 Israeli artillery in the Golan could have targeted it. Although the tactical picture is messy right now, the scope of Israel’s target set, and the reported use of Patriot interceptors, are clarifying. It’s not a small operation Israel is mounting. This isn’t a one-off strike against a weapons convoy or a single Iranian capability in Syria. It’s also not a small retaliatory response Iran (and possibly Hezbollah) are making. Moreover, although it’s not entirely clear yet how much Assad’s forces are directly involved, Assad is apparently making no effort to stay out of it, or distance himself from the Iranian military assets now embedded around Syria. There have been numerous reports from inside Syria that the regime air defense force is engaging Israel. Most of the claims of heroic success can be ignored; all the reports should be taken with a grain of salt. But there is enough noise to validate the reports that the Syrian air defense system is using live fire – and Israel appeared in the last couple of hours of the nighttime strike package to have started targeting regime air defense units. That would indicate they have indeed tried to target Israeli assets. Other reporting also suggests regime artillery has launched rockets into Israel across the Golan. It isn’t clear if this is a media campaign to claim Syrian responsibility for what the IDF has identified as a rocket barrage from the Iranian forces in Syria. But even if it is, that in itself indicates Assad is all-in for identifying with Iranian instigation. If Assad is going for broke, hoping that Israeli attacks on his forces will ignite a larger regional conflagration, I suspect he’s in for disappointment. At this point, we can’t firmly predict the scope and duration of what Israel has in mind. The IDF has little room to “wait and see” what Iran does next from Syria, or Hezbollah from southwest Syria or Lebanon. But the Israelis may use whatever limited latitude they perceive in that regard, giving Iran the chance to stand back from escalation. The IDF will need to do damage assessments anyway, after the strikes overnight. As a starting baseline, however, Israel probably has a plan that would take several days to execute, and will pursue it to conclusion if necessary. Keep in mind that what Israel knocks out from under Iran in Syria will benefit U.S. policy, both there and in Iraq. The whole region will benefit from Iran’s armed build-up in Syria being dealt a major setback. Trump will presumably let Israel do the heavy lifting on this one, in terms of attacking the Iranian positions in Syria. But Israel is not on her own. Where Israel doesn’t have the reach to make sure the current operation is contained in Syria, the U.S. can do so. And we should. Iran needs to be denied the use of Iraq as a transit corridor for logistics, combat air operations, and missile overflight. Trump can ensure that. Iran won’t like it, and it will annoy Russia – but neither of them is going to fight the U.S. over it. America should also close ranks with Jordan, Saudi Arabia, and Egypt to prevent sympathetic eruptions from terror cells and insurgents against their governments. As the scope of tonight’s attacks becomes clearer on Thursday morning in the U.S., we can expect another round of predictions that Trump is bringing apocalypse and cataclysm on us. There are good reasons, however, to be optimistic that Israel’s pushback against the Iranian build-up in Syria will not only be accomplished without destabilizing the region, but will actually function to improve stability in the Middle East. An Iran daunted from continuing on her radical course is exactly what the Middle East needs most.